Anyone who lives along the East Coast corridor doesn’t need me to tell them about the once-in-30-year high pressure system that has kept us, and continues to keep us, in a flow of incredibly warm, humid air. It appears that this is with us through mid-month, though there is some forecast cooling of temps both day and night so that salmon may not be in as much danger as they have been in. Daily high water temps the last few days have not been as high as feared, and that is a very good thing. By all reports the salmon have survived it all reasonably well, even though the brook-fed holding pools are stuffed with fish. 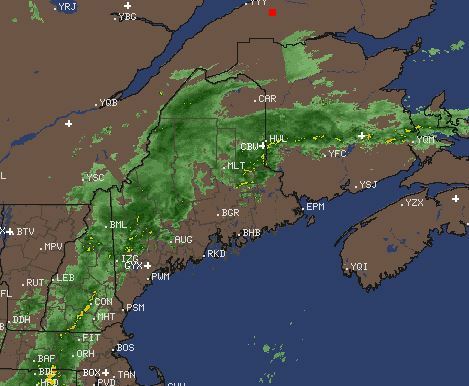 Right now we have some good news in that as you can see from this late Saturday morning radar snippet that the Miramichi watershed is getting some very beneficial rain, perhaps as much as an inch and a half or more in places. As I write this Bantalor – headwaters of the Cains – had a full half inch in 2 hours’ time this morning, and this system is just getting going. We have a couple more really warm days in Monday and Tuesday, with forecast highs of around 30C, but after that there is a modest cooling off. This rain will bring the rivers up quite a bit. That will not only cool them off a little now, but will make them much more difficult to heat up in the days ahead. The Millerton trap numbers for the salmon run up the SW branch of the Miramichi are posted in the graphic on the right. Bear in mind that on average the trap catches about 5% of incoming salmon and 10% of grilse. As you can see when it comes to salmon, we started June with 31, which is comparable to or better than recent years. In fact I went back and looked at many past June counts, and 31 is a historically good one that almost always forecasts a decent to excellent year. The grilse numbers, though, were half of recent years, and indicate a continuation of the trend to poor grilse runs that we have seen over the last 5 or 6 years. However, after June things kind of fell apart. 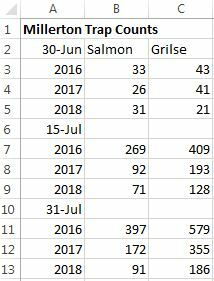 The counts for July show that a very small number of salmon and grilse entered the trap during July. I spoke with DFO officials in charge of the mark and recapture program at the Millerton trap. I asked them if it was known whether or not the salmon were less likely to come up out of the Bay and into the Millerton trap in high water temperatures. My contact said that there was no scientific proof that this was the case, but that it seemed likely. I suggested that it seemed like a worthwhile area of study for DFO. Certainly if warm temperatures have a negative effect on the Millerton trap numbers this would the year be when that would be born out. In looking at the statistics I found another year back in the 1990s when we had only 91 salmon by the 31st of July. That year went on to have nearly 1,000 for the season – a solid year. That doesn’t mean that we will this year, but it will be interesting to see how things unfold once we get back to some normal temperatures. I try to post news on the weather and salmon fishing on a daily basis to the Salmon Report page on my website. Check it out at this web address when you want a little current information. On the weather maps. We have not had any rain since May, it should start raining again in late September.Our summers are dry. Iceland. Sommy blanked for the first two days but got one this morning, needless to say he’s back on the amber liquid. The river they are on is Haukadalsa. Nine of them sharing five rods. Cost per head is just over five grand. I get a season ticket on the Wick for fifty pounds and will probably catch more than them. I wish we could have sent some of the rain we got in the Hershey, PA area up to the Miramichi Valley. In the last seven days we have had over 17″ of rain. Can’t wait for our annual Oct. trip. Brad – Apropos the weather, a tarpon and a king mackerel have been hooked here off our Nantucket beaches in the last couple of days. We’re waiting for the bonefish to arrive! Hope you got that rain. I know so well how the weather forecast can ‘let you down’. Also when it gets really dry, as Scotland the past month, even a decent splash of rain will disappear into nothing. Just hoping for some decent water to fish when I come out in second week of September! I had a bonus week offered to me commencing 20th August on the Nith. The secretary of our fishings just said (almost) out of the blue I could fish his second rod week. I’ve no idea why he can’t- it is not a bad week usually. That’s the kind of luck a fisherman needs! PS On the trap numbers in drought and warm condiditons, I think the newly arrived salmon just ‘know’ that it ain’t worth moving on up to the river. They also ‘know’ even before a next weather system moves in and get ready to run, even in coastal waters becoming very active, as a salmon netsman (I was doing some journalism on him and went out on his boat with Trout and Salmon magazine) once told me – they would catch many in the drift nets before the rains came as the fish livened up considerably. PS Of course we are all thinking of the health and shorter and long term welfare of the salmon stocks in the dry and warm conditions – cf the Gaula in Norway closing the river in the recent hot dry and very low water. Henry – thanks for all of your comments. The rain was a mixed bag. The headwaters of the Miramichi got a little less than a half inch which is quite a disappointment, though it is still a fair rain and will help that area. The middle of the Miramichi around Boiestown to Doaktown appeared to get a lot of rain, though there is no good gauge available there. The Cains headwaters station at Bantalor got more than 40mm, and Meadowbrook – a little further down river – got almost two inches. The Cains will rise up a ton, and that will be very good for the river down stream of the mouth starting at Black Brook. Unfortunately the tropical warm weather pattern will persist at least for another week to week and a half. Incredible!